My love affair with the Fiat Cinquecento (cheen·kweh·CHEN·toh) began when I was 16. I really wanted one, but it would not fit into my valigia, so I had to settle for something else. I don’t know if I will ever own a super cute Cinquecento, but I have spent years photographing them all over Italia. 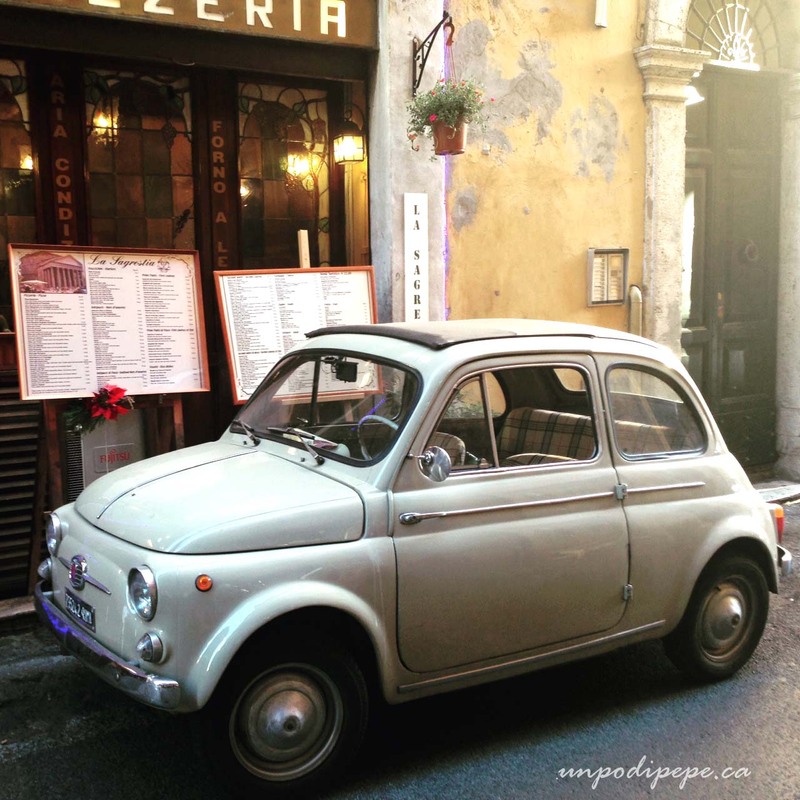 A few weeks ago in Roma, I took this photo of an adorable Cinquecento just around the corner from the Pantheon. After posting the photo on Instagram, I learned that this is the original Cinquecento model, the 1957 Cinquecento Nuova! It has a smaller engine, the cloth roof folds back all the way rather than half-way, and it has ‘porte di suicidio’ or ‘suicide doors’. These are doors hinged at the rear rather than the front. They are named so because before the use of seat belts, there was increased risk of falling out of the car if the doors accidentally opened. Not only that, but the airflow of the moving car keeps the doors open, rather than closing them, as would happen with a front-hinged door. This does make it easier to push someone out of the moving vehicle, which is probably why all the 1930’s gangster movies have cars with rear-hinged doors! The Cinquecento was the first real ‘city’ car, a small, light-weight, fuel-efficient car. Cinquecento means 500 in italiano. The car was given this name because the engine was 500 cc and it weighed 500 kg (1100 lbs). Today most cars weigh 3 times that amount! The owner of this Cinquecento was a very old man with a cane. He could well be the original owner. I hope he buckles up his cintura! I love them too – maybe not as long as you! On my first trip to Italia (for my honeymoon…) I met Zio Ernesto and his cinquecento – both have passed on but are fondly remembered. I hope you get one someday – a real original! Grazie Signora Martini-I hope so too! I love these cars too. Almost like toys. Smarts are not quite in the same league, Though small, they lack that ‘carino’ factor. Assolutamente Francesca! Nothing does carino like a Cinquecento! You said it – super cute! Funny particular about the “porte di suicidio” if you’re not the one falling out. Da vero! They’d be a bit safer now with seat belts. The proper name for them is actually ‘Porte a controvento’ which is also funny!